The Kern County Basque Club invites you to join them for dinner and a reverse drawing on April 18th to support the Gure Ametsa Basque dancers. Proceeds from ticket sales will go to the dancers who are raising money to represent their club at Jaialdi this year in Boise, Idaho. Cost of the ticket is $75 and includes the opportunity to enjoy a "delicious" paella and lamb dinner as well as get a chance at winning $5,000, all while supporting the dancers. Please contact Maria Torretta for more information. Sorte on! 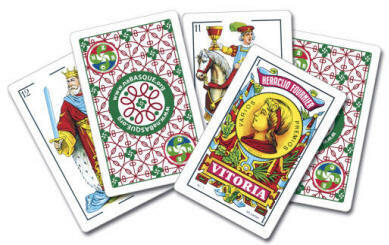 The 20th Annual Euskaldunak Club Mus Tournament will take place on April 25th at the Monticola Club (140 S. Lassen Street) in Susanville, CA. Check-in will begin at 8:30 with play starting at 10am. You must be a member of the club to participate in the tournament, and the $15 dues may be paid along with the Mus fees of $45 per player. The fees will include lunch for players, but others not playing Mus, are invited to join them for lunch at noon to enjoy a menu of lamb chops, salad, cheese, bread and wine. Cost of the lunch for non-players is $12.00. For more information, including how to pre-register, and hotel information click here or email Michelle Zulbillaga. The Bilbo Zaharra Euskaltegia in collaboration with HABE and others is currently organizing the 8th edition of Klasikoen Irakurketa Jarraitua (Uninterrupted Reading of Classics) that will take place on June 5th from 8am-8pm at the Arriaga Theater in Bilbao. 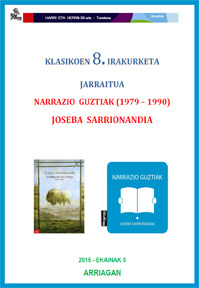 This year's chosen classic is Joseba Sarrionandia's Narrazio Guztiak (1979-1990). The work will be divided into passages and the idea is to have them read by several people, who represent all social sectors. The goal of the event is two-fold; on the one hand, it is a great way to feature Basque students who have worked so hard on learning the language, and on the other it also reflects the importance of Euskera outside of the Basque Country by including Basque speakers from abroad. If you would like to participate please respond by April 20th so that the passages can be sent out. The hope is that the reading would be recorded and returned in enough time to be included at the event on June 5th. For more information email Kinku Zinkunegi. Aupa Euskaldunak!